Some of you may know of the twenty-year long study of the Temple of Luxor by the Egyptologist René Schwaller de Lubicz (see bio). Before that Schwaller was a Theosophist, esotericist and alchemist who worked for many years with Fulcanelli. In the 1920s, René and his wife Isha moved to Switzerland and established Suhalia, a center for research into scientific and alchemical studies. While there he developed a motor that ran on vegetable oil. 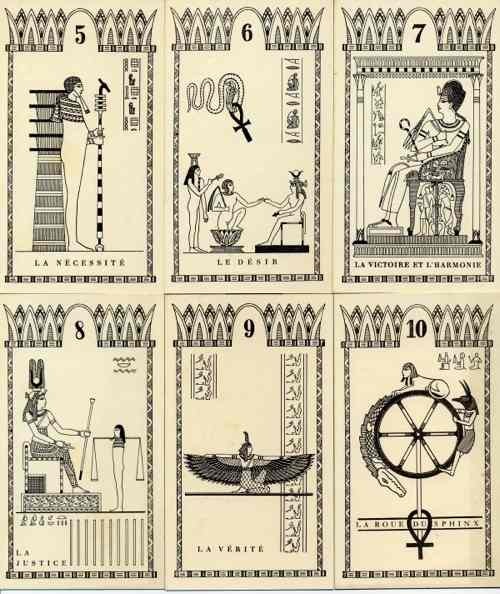 Although I’ve read several books by Schwaller I never knew that he had created his own tarot deck until sent these cards by Christian Dumolard (who documented the Château des Avenières Tarot mosaics of Assan Dina). Information on Schwaller’s tarot interests can be found in Schwaller de Lubicz by H. Dossier and Emmanuel Dufour-Kowalski. You may want to compare the Schwaller de Lubicz Tarot with that of Falconnier and Wegener (see History of Egyptian Tarot Decks). He was obviously considering some notable differences. Enjoy. It has been years since I read Schwaller de Lubicz. I remember that I found his books interesting, but couldn’t quite get his message. 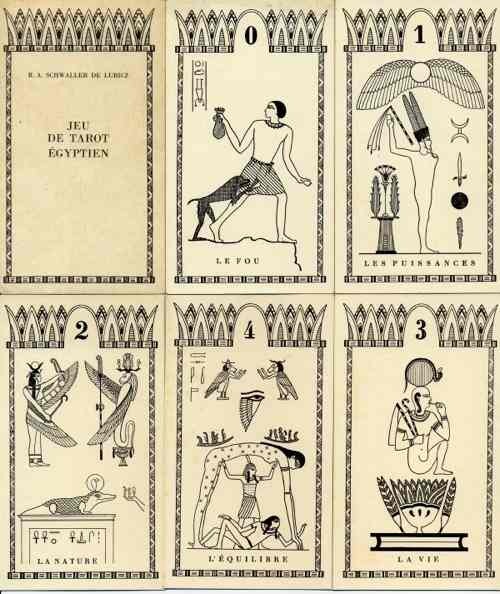 However, even though Egiptians Tarots are not my favorites, I confess I found this one fascinating. The title of the Moon, “The Boat without a Pilot”, is simply wonderful. Now, there are more than 22 cards. The last three (or four) are Minor Arcana? They do look like variations of the Lovers, the Chariot and Justice. These look great. Would it be possible to get high resolution scans of them? Sorry, but this is what I have – 72 dpi. 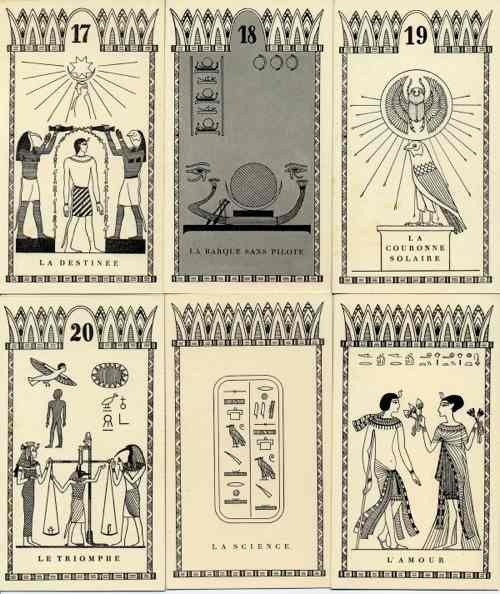 Hmm they truelly look original in their view of “egyptian tarot” The collector in me wonders when they where published and if they are still obtainable. Stefan – I have no idea of their availability, but I had never heard of their existence before, nor do I have a date for their creation. This is absolutely fascinating! Just glansing over the cards Aor was incorporating his sophisticated typology of the ‘symbolique’ long before he problematized it in print. The card that represents the hierophant is especially interesting here, being the godhead of the Memphite patheon Ptah. Thanks for putting up this material by Schwaller. Hopefully this will begin sparking more interest in his overall work and the solid perspective on both esotericism and Egyptology which he and his wife Isha brought. Wahid – I’ve been amazed by how many Schwaller fans have let me know how much they appreciate seeing his deck! Best wishes for the success of your own deck. I find it amazing how many forms the tarot inspires. Personally, I’m a bit conservative when it comes to the number of cards in a deck. 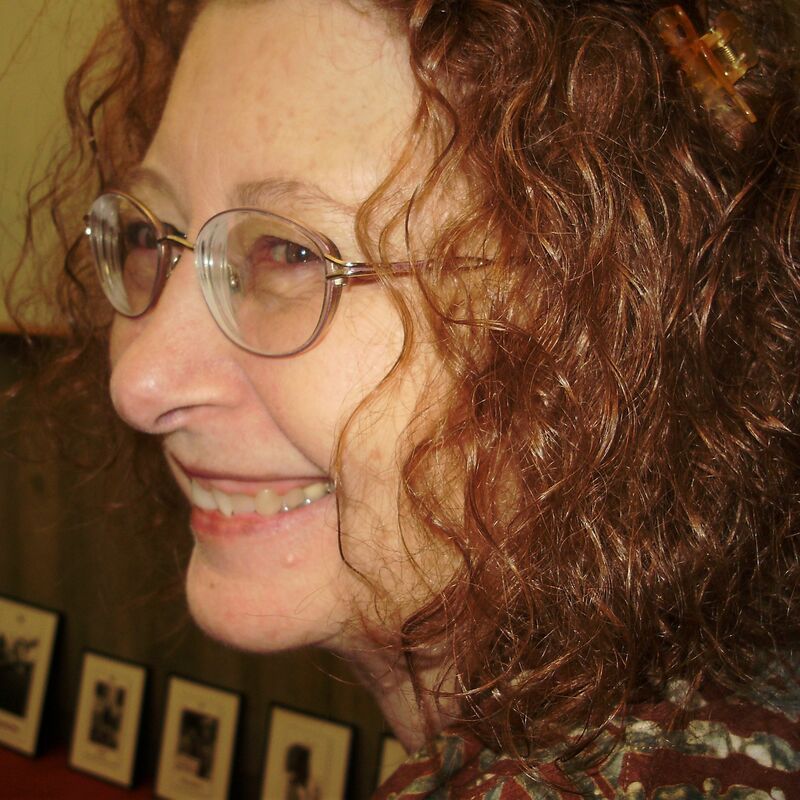 It sounds like you are creating more of a Tree of Life Oracle deck since the Kabbalistic template you speak of was grafted onto the Tarot (along with supposed Egyptian origins) less than 250 years ago. Still, it’s a fascinating concept to work with. Thank you for posting these Mary. This is great to know about and to look at. 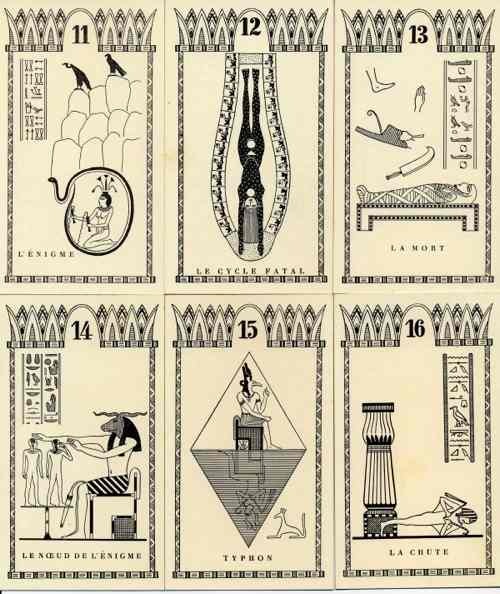 One online bibliography says the twenty-five cards are from 1926. Published from de Lubicz’s Suhalia community. They appear to be available from at least one website in France for 36 euros. (I think it’s ISBN 2865540154). John – Thanks for the additional information on this deck. Hi Mary ! I’ve just found out about this deck, which I find very mysterious and quite different compared with the “original” tarot cards titles. As it is very rare, I would like to ask you if you have got more informations about the last four cards, which have no numbers ? It would be great from you ! Max – The only information I have is in the post or the comments. I haven’t been able to find out anything else specifically about the deck. Thank you for your kind reply, Mary. Even in French I can’t find any information about the add of those specific cards, nor their meanings. 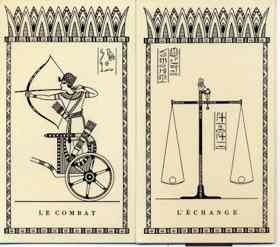 Some suggested on French boards that for example, the Exchange card would suggest “Justice”, but as we can observe, there’s already a card for “Justice”. Anyway, thank you for your answer 🙂 Have a nice day/evening ! Max.